The launch of British Black Music Month (BBMM) 2014, which took place at Harrow Civic Centre on Saturday May 31, as part of the Mayor’s Community Open Day, ended with a live rundown by Sound Fusion Radio presenters DJ Gloss and TS of the Top 20 Favourite British Black Music Tracks poll. Soul II Soul’s debut single, ‘Fairplay’, which made a lowly no. 63 on the pop charts in 1988, was voted Britain’s most popular domestic black music track. The group also held the third position with ‘Back To Life’, which became its only pop chart-topping single in 1989. The enduring group, which continues to perform in its initial guise as a DJing sound system, also held two places on last year’s Favourite British Black Music Videos poll, where ‘Keep On Movin’ was no.1 and ‘Back To Life’ no.3. The top five of the latest poll includes Aswad’s instrumental reggae ‘underground classic’ ‘Warrior Charge’ at no. 2 and Omar’s ‘Music’ at no. 4. Interestingly, their better known tracks, Aswad’ 1987 pop chart-topper ‘Don’t Turn Around’ and Omar’s 1991 top 20 ‘There’s Nothing Like This’ which was placed at no. 2 last year, did not make a showing. A new name, soul/jazz singer Debra Debs’ ‘Fizzy Lemonade’ was no. 5. The rundown will be broadcast on SoundFusionRadio.net on Sunday June 8, 2-3pm. The launch included journalist/author Lloyd Bradley reading from his latest book ‘Sounds Like London: 100 Years Of Black Music In The Capital’, and a discussion on diversity and racial justice with veteran broadcaster Alex Pascall and Yvonne Deutschman, whose collaborative documentary ‘Let The Music Talk’ preceded the discussions. BBMM2014 continues in Harrow with the Mayor’s Social this Saturday June 7, 7-10.30pm at Harrow Civic Centre. DJ Da Prezedent and KMT will be playing a purely British music set covering reggae, lovers rock, hip-hop, and jazz-funk, etc, plus Reggae Film, Music & Fun, a family friendly event of films, music and talks at Flash Musicals Theatre on Saturday, 28 June 2014, 3-7pm. 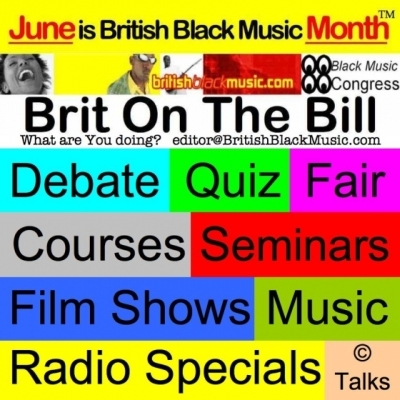 BBMM2014, which ends late July, offers a range of events including seminars and music industry courses, in different parts of London. For more details: www.BBM.eventbrite.com or www.BritishBlackmusic.com.